Suriya-Samantha-Nithya Menen starrer '24', a Sci-fi thriller is directed by Vikram Kumar of Yaavarum Nalam fame and is produced by Suriya under the banner of 2D Entertainment. The film's post-production works are on full swing and producers are planning to release the movie by first week of May. The single track 'Kaalam En Kadhali', crooned by Benny Dayal and composed by AR Rahman was released yesterday and it has eventually become the overnight Chartbuster. Within a short span of time, it has become the highly listened views and downloads from online portal. It has evoked the fans to wait for the complete album to be launched shortly. The movie makers recently released the teaser which was raising the expectations about the film. In this film, Suriya will appear in triple action which is most amazing thing about the film. 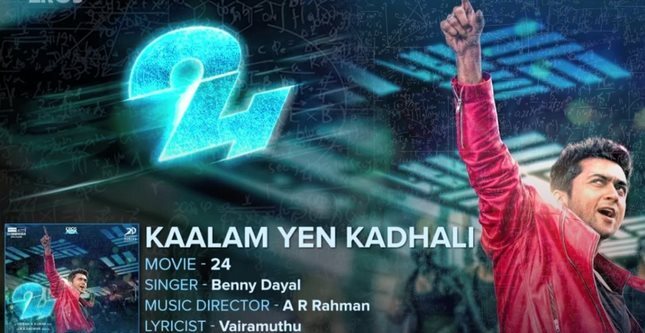 Watch the Lyrical video of the single song 'Kaalam Yen Kadhali' from the Tamil movie "24".